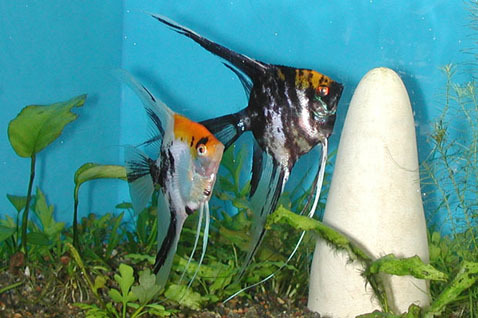 Angelfish are the most popular cichlids in the aquarium hobby. The wild Angelfish that come from the Amazon region of South America are basically silver with black vertical stripes. 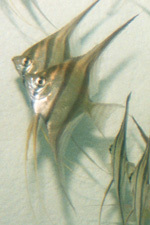 There are 3 know species of Angelfish Pterophyllum scalare, Pterophyllum altum, and Pterophyllum dumerili. The common Angelfish we most often see in the hobby are decedents from Pterophyllum scalare, and in some non-English languages the common name is Scalare. Common Angelfish come in many color varieties, and couple of scale types. All common Angelfish are easily spawned, provided you give them what they require. Angelfish come from waters that are for the most part soft, acidic, and very warm. While they have adapted to aquariums with higher pH and hardness, you usually have a higher hatch rate if your water is soft (50 to 100 ppm total dissolved solids - TDS) and acidic (5.5 to 6.8). If you have hard water and you would like to make your water soft, purchase a reverse osmosis (RO) filter that can be connected to a faucet. Most RO filter systems can reduce the water hardness out of the faucet by 95 to 99%. A large plastic trash can be used to collect the water for future use. When you have soft water, the detritus build up in the aquarium and filtration system will often cause the pH to drop naturally. You can help this process along in a new aquarium by adding sphagnum peat moss, or peat moss available at aquarium supply retailers. There are also powdered and liquid chemicals sold in the hobby that will lower the pH, but if you are not careful with these products you can kill your fish by adding to much at a time. These chemicals are also made of different types of acids, some contain phosphate which can cause increased algae growth. Read the fine print on the label to make sure the one you are buying does not contain phosphate. When adding chemicals to a freshwater aquarium to adjust the pH either up or down, it should be done gradually over the course of several days and in some cases weeks. An adjustment of .2 to .3 per day is safe for most fish. Check the pH the day after you add the chemical, allowing time for pH to adjust. If the pH is not at your target range, add another dose. Continue adding a dose every day until your target range has been reached. Adding to much acid or alkalinity booster at one time can cause pH shock in fish, which normally results in death. If your water is soft to begin with, your pH can be more radically effected by an acid or alkalinity booster. Never add more than is recommended, and to be on the safe side, add less than is recommended the first few times you use a product to get a indication on how the chemical will effect your pH. For breeding and raising Angelfish a water temperature of 82° to 85° F (28° to 29.5° C) is ideal. 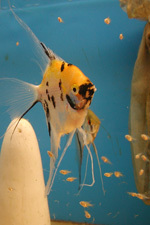 Breeding Angelfish in a 20 gallon (76 l) tank or larger is recommended. The pair of Angelfish should be the only fish in the tank. Filtration can be provided by a hang on the tank power filter or a simple air driven sponge filter. I prefer a hang on the tank filter with a nylon bag wrapped around a flexible plastic grid that is wrapped around the intake to the filter. This prevents fry from being sucked up by the power filter. I am not a fan of sponge filters in breeding tanks, because when the sponges are cleaned you loose a lot of beneficial bacteria, often resulting ammonia and nitrite spikes a few days after cleaning. The tank can be a well decorated planted tank, or bare bottom with just a spawning surface placed in the tank. Bare bottom tanks are used by most professional breeders because they are easy to clean. To condition the parents for spawning feed frozen (ex: brine shrimp, bloodworms, mysis shrimp, glass worms) or live foods (California Blackworms, tubifex, brine shrimp). Foods that are high in protein (above 60%) are best. Generally, flake or pellets are not used for conditioning, and are fed only as a supplement. Angelfish are vertical spawners, so provide them with some type of vertical object in the aquarium that is at least 6 inches (15 cm) tall. This object can be a broad leaf plant, slate, PVC pipe, red clay brick, spawning cone, or a tall terracotta pot. Even when Angelfish are provided with a surface to spawn on, they will sometimes spawn on the side of the tank. Spawns can range from a few hundred eggs to a thousand or more. 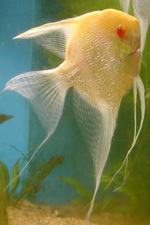 Angelfish have a reputation of eating their eggs or fry. Most professional breeders remove the eggs from the parents a few hours after they have spawned to a hatching tank. If you want to see the cichlid parental care, you may have to go through a few spawns before the pair raises a batch. When Angelfish do not have fry to take care of, they will usually spawn every 10 to 14 days. While the parents have fry to take care of they will not spawn again until the fry are removed (there are occasional exceptions). Left to right, Black, Albino Pearl Scale, Altum (Pterophyllum altum), and Koi Angelfish. Once the Angelfish have spawned, they will care for the eggs by fanning them with their pectoral fins, remove any eggs that are infertile with their mouth, and defend a territory around a spawning site. The eggs will take approximately three days to hatch, at which time the parents will move the fry to a new vertical surface. The fry will remain as wrigglers for four days before they start free swimming. You do not feed fry during the time they are wrigglers. Once the fry are free swimming, feed them live newly hatch baby brine shrimp two to three times a day. By the time the fry are three weeks old, convert them over to frozen adult brine shrimp, California Blackworms, or a good beef heart frozen food. Dry foods such as pellets or flake food can also be offered, but only as a supplement. By the time the offspring are two months old, the body size average should be around ⅝ of an inch (16 mm) +/- ⅛ inch (3 mm). The growth rate of fry in every batch is highly variable. You can increase the growth rate of the smaller fry by raising them in a separate grow out tank. After a few weeks in a separate tank they will often catch up in size with the other fry. Why this happens with so many species of cichlids is still a mystery, but it may have to do with the stress of just being smaller fish. While it is not well documented, Angelfish fry will start to pick at the sides of their parents when they have been free swimming for about a week. If you do have a pair of Angelfish raise a batch of fry, remove the fry from the tank by the time they are three (3) weeks old. If you leave the fry in any longer you run the risk of fry picking open wounds on their parents, causing bacterial infections that could cost them their life. Silver Angelfish at about two months of age. After you have raised all these fish, you can often trade them in for credit at your local fish store (LFS), or sell them to a wholesaler in your area. Wholesalers will not give you as much as a LFS, but they will usually take hundreds of fish at a time. Breeding and raising Angelfish is not difficult, once you have done it. 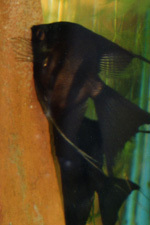 Experience you gain from breeding Angelfish can be applied when raising other cichlid species, as there are many with similar behavior, and can be raised with the same technique.